Condi Rice “suddenly cancels a trip to Israel.” So what? Condi’s previous trips to Israel have accomplished nothing. She’s essentially the White House ‘errand girl.” The most feckless Secretary of State since Edward Stettinius. Ironically, Cheney assigned Elliott Abrams to serve as Condi’s minder on her visit to the area after the Hamas-Israel-Lebanon conflict. Of course it produced zilch, which is precisely what Cheney was counting on. The paranoid Cheney sent Abrams even though the latter pledged he’d never served as a U.S. [envoy] again as a result of his involvement in Iran-Contra. He needn’t have worried. Condi has done less to advance the Mideast peace process than any SecState in memory. Finally your contention that Israel has the green light to attack Iran nuke facilities is based on speculation, not evidence. Thanks for reading, Martin. But last things first: That wasn’t my speculation that Israel has the green light to attack Iran. Israeli Minister of Strategic Affairs Avigdor Lieberman said on Tuesday that he received the tacit blessing of Europe and the United States for an Israeli military strike on Iran’s nuclear facilities. “If we start military operations against Iran alone, then Europe and the US will support us,” Lieberman told Army Radio following a meeting earlier in the week with NATO and European Union officials. Lieberman said the Western powers acknowledged the severity of the Iranian nuclear threat to the Jewish state, but said that ongoing conflicts in Afghanistan and Iraq are “going to prevent the leaders of countries in Europe and America from deciding on the use of force to destroy Iran’s nuclear facilities,” even if diplomacy ultimately fails. NATO leaders reportedly told Israel that it would have to stop Iran’s nuclear program alone. Israeli Strategic Affairs Minister Avigdor Lieberman, who visited NATO headquarters in Brussels two weeks ago, came away with the impression that Western powers are unwilling to resort to pre-emptive military strikes to prevent Iran from acquiring nuclear weapons, Yediot Achronot reported Tuesday. I noted that there was more than a whiff of conspiracy theorizing at work. And Rice’s cancellation of her trip, in any case, wouldn’t have been her decision. Cheney makes the decisions, as I’ve been saying for years. And it’s undeniably scary that Avigdor Lieberman, a very high Israeli official, is beating the war drums, as he has done so often. The guy was Bibi Netanyahu‘s chief of staff, for G-d‘s sakes. Lieberman (very high indeed) is infamous for proposing an ingenious apartheid plan for cleansing Arabs from Israel. That was too extreme even for Ariel Sharon, who dismissed him in 2004. Now Sharon is dead, and Lieberman is back in the government as a deputy prime minister. Speaking of reckless, you could call the Bush-Cheney “team” Feckless and Reckless, kind of a horror/vaudeville duo. “Feckless” is better applied to Bush, but as for Rice, yes, she’s strictly from hunger. 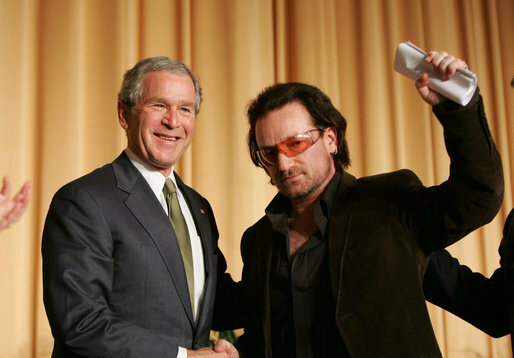 The only pro Bono action the fluffy major domo has ever taken is to bask in a photo-op with that rock star.